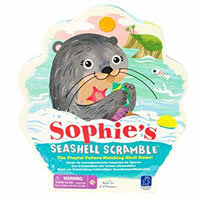 Help your children learn to identify and match patterns with this fun Oceanside game called Sophie's Seashell Scramble. Children will use the Sophie squeezer two help pick up seashells of matching patterns. If they are the first to collect 5 they win. This playful pattern-making seashell game is a favorite amongst younger kids. They'll get excited about the ocean theme of this game and will love picking out patterns. As with most children's game, this one doesn't take long to play or learn how to play with the game rules. Consider adding this game to your collection if you have younger players. Be the first to collect 5 shells with one of each pattern and you'll win. This game comes with a seascape game board, a Sophie squeezer, 20 shells with patterns, 4 shell snack mats, a game spinner and the official Sophie's Seashell Scramble game rules and instructions. Please keep in mind that the official Sophie's Seashell Scramble childrens rules and instructions could be different depending on the game version you have. The rules below are some of the exact directions on how to play Sophie's Seashell Scramble. Share with us your comments, funny stories, tips, advice, strategies, creative ways to play, questions about how to play, problems with the rules or anything you want about Sophie's Seashell Scramble. All submissions will be reviewed within 24 hours. Click here to add your Sophie's Seashell Scramble comments.